Since leaving Dutch Harbor on 2 August 2010, the USCGC Healy has traveled north through the Bering Sea en route to the Arctic Ocean, where we will embark on the third year of an international effort called the Extended Continental Shelf Project. In a few days, we will rendezvous with the Canadian Coast Guard Ship (CCGS) Louis S. St. Laurent in the Arctic Ocean. The objectives of this mission are to perform detailed bathymetric mapping of the seafloor and imaging of the subsurface and to collect physical seafloor samples in the part of the Arctic known as the Beaufort Sea and Canada Basin. I will write more about this over the next few days; in a nutshell, we want to determine the limits of the extended continental shelf in that region. Our primary role on the Healy is to serve as the lead ice breaker for the Louis so that she can collect multichannel seismic reflection data of the subsurface. At the same time, Healy will collect multibeam bathymetric data and high resolution seismic reflection data and obtain seafloor samples using a variety of dredging and coring methods. 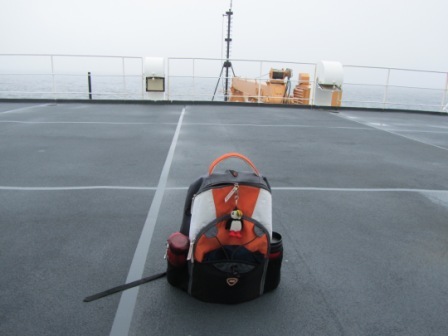 The extent of our work may be influence by sea ice conditions which can be unpredictable.One of my responsibilities on the cruise is to serve as a “Watchstander” for the geophysical data collection. Watchstanders work in pairs and are responsible for keeping an eye on the computer monitor displays of the data that is continuously collected by the multibeam sonar and “chirp” (seismic reflection) data and to call in the experts if something goes wrong. Water depths are shallow and the seafloor relatively featureless on our traverse through the Bering Sea, but the data will likely become more interesting when we reach out destination. This is the time to learn about the equipment and understand our responsibilities so that we’ll be sharp when our data collection efforts become more critical. Last year’s mission mapped a previously undiscovered seamount! My watch is from 2000 to 0000 (8 p.m. to midnight), which leaves me lots of time during the day to write, research, and wander around learning about the ship. Later in the mission I will be involved in the sampling efforts when I am not on geophysical watch. It has been smooth sailing since leaving Dutch Harbor, and we have moved relatively quickly, slowing occasionally when the fog thickens. 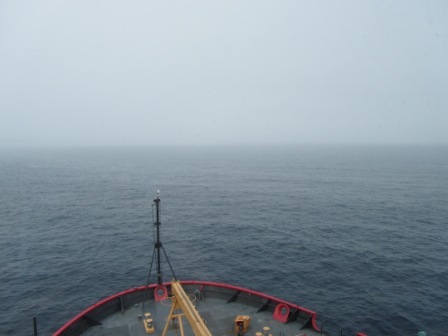 Foggy conditions are common in the Bering Sea and Arctic Ocean. 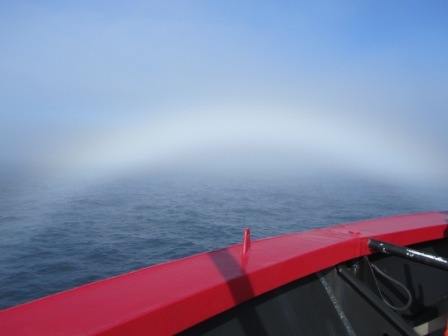 I went out on deck early yesterday evening to enjoy a brief period when the sun was visible above the fog, and was treated to the sight of a “fog bow”. NOSB folks will be happy to know that my puffin is accompanying me on my journey, even when I’m on watch. I’ve seen both horned puffins and tufted puffins from the ship, and I’m beginning to be able to tell the difference, but nothing beats the show the horned puffins put on for us in Dutch Harbor. If you want to see awesome bird shots, take a look at Bill Schmoker’s journals, which you’ll find linked on the upper right side of my blog page. Earlier this afternoon, we passed near a small island called King Island in the northern Bering Sea. There was a lot of seabird activity closer to shore, and I was fortunate to be on the Bridge watching when the marine mammal observer saw a gray whale. I got to see it surface and dive once; no time for a photo, just firsthand enjoyment of the experience. I took a break while writing this log to go back to the Bridge as we passed through the Bering Straits. The view was the same as it was for the rest of the day, but I wanted to have the best view in the house for the experience. Today is Coast Guard Day which commemorates the formation of the Revenue Cutter Service in 1790. 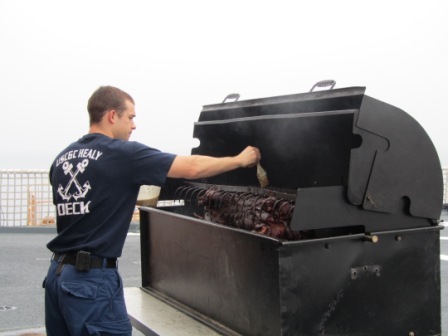 In honor of the occasion, the Coasties roasted a pig out on the helo (helicopter) deck and served a picnic style dinner in the Mess tonight. I did a search to learn more about Coast Guard Day. According to the U.S. Department of Defense, the Treasury Department established the Revenue Cutter Service in 1790 and “authorized the building of a fleet of ten cutters, whose responsibility would be the enforcement of the first tariff laws enacted by Congress under the Constitution.” The name “Coast Guard” was adopted in 1915. 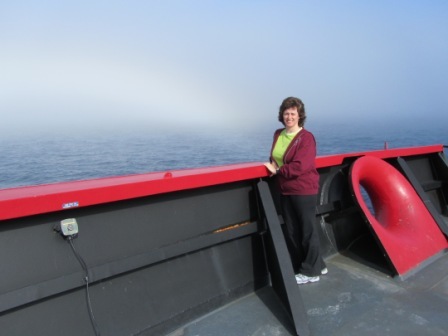 This entry was posted in 2010, Caroline Singler, NOAA Teacher at Sea and tagged Arctic Ocean, Bering Sea, chirp, geophysical data, International Continental Shelf Survey, multibeam sonar, USCGC Healy, Watchstander. Bookmark the permalink.